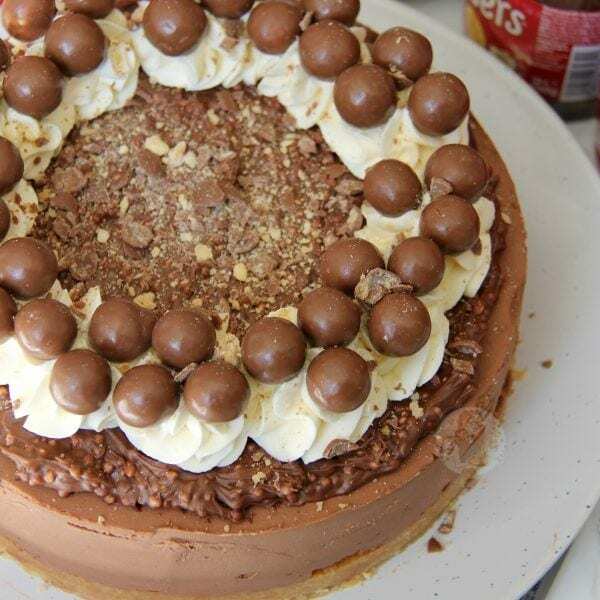 Delicious & Chocolatey Malteser Cheesecake – Malt Biscuit Base, Chocolate Malt Cheesecake, Malteser Spread, Sweetened Cream, and Maltesers! Perfect Showstopper for any occasion! This cheesecake is SO delicious chocolatey and moreish – that I ate the whole thing myself with a fork. I’m kidding. 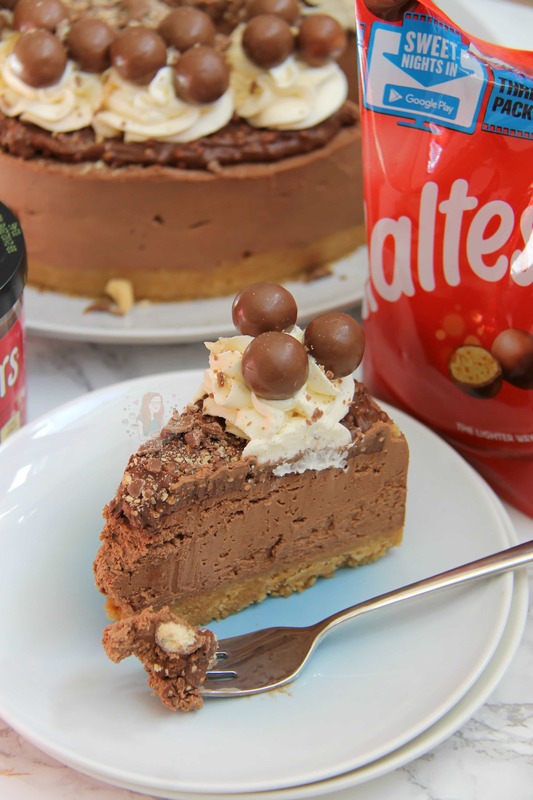 (I wish) Anywayyyy… I have had so many requests for Malteser Cheesecake that I have literally lost count – after the success of my No-Bake Caramel Rolo Cheesecake I thought I would oblige! I did think that I could just use the recipe of my No-Bake Chocolate Crunch Cheesecake which is deliciously simple, but just add Maltesers on top – but I felt like this wasn’t enough! 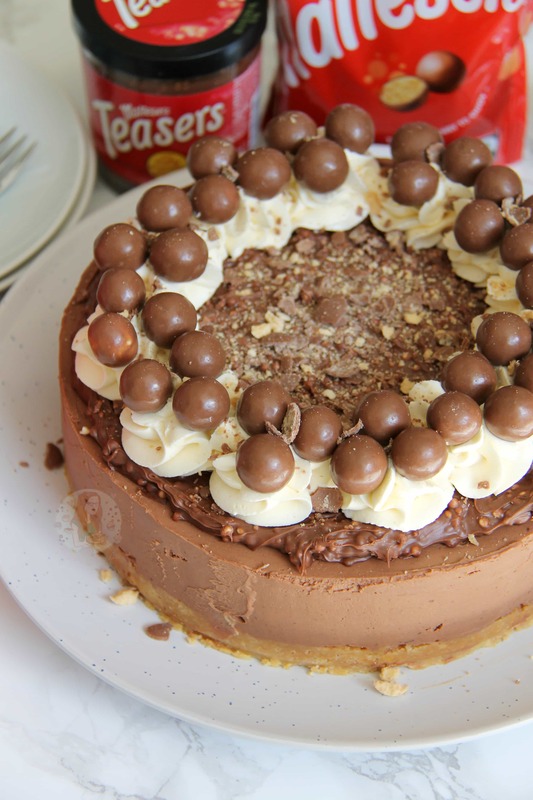 I had a look on Pinterest and at other recipes and found that people literally put Malt Chocolate Powder into whatever they want to be Malty so I thought that this would match perfectly with my quest – and it didn’t disappoint! It was SO yummy! I have had people message me in the past and question how a Cheesecake can set so well, if it doesn’t use gelatin, or it isn’t baked and the answer is simple, you just have to stick at the ‘whipping’ of the cheesecake filling! I Use my KitchenAid as its far more powerful that me and my little arm whisking it on its own! You simply have to put the Cream Cheese, Icing Sugar, and Malt Powder into the bowl and mix it until smooth – this means that the sugar will be blended perfectly. When this mix is smooth, you pour in the Double Cream – You don’t have to whip this first then fold it in if you do it correctly! I pour my Cream in, and continue to whip on a relatively high speed for a couple of minutes, you will see it start to thicken. When its glossy, thick, and mousse like you can pour in the Melted Chocolate and continue to whip – this will thicken the mixture even more itself and you continue to whip until its very thick and holds itself completely! Or – swap the chocolate and cream around and do it like the method suggests – either way is fine! Seriously though, this dessert is an utter crowd pleaser and everyone will like it – try it and let me know what you think! Blitz the biscuits in a food processor to a small crumb, add the butter, and pulse a few times until it is combined well. Tip into a 8″/20cm Deep Springform Tin and press down firmly – chill in the refrigerator whilst you do the rest! Melt the two chocolate’s in a bowl over a pan of gently simmering water, stirring gently or microwave in short bursts until fully melted – leave to cool slightly whilst doing the rest. With an electric mixer (I used my KitchenAid) Mix the Cream Cheese, Icing sugar, Vanilla, and Malt powder until combined – pour in the Melted Chocolate and whisk again till combined. Then, pour in the liquid double cream and continue to Whip the Cheesecake Mixture until it is starting to thicken a lot like a Mousse does! Pour the mix on to the biscuit base, smooth over, cover, and chill in the fridge for at least a few hours hours or overnight. 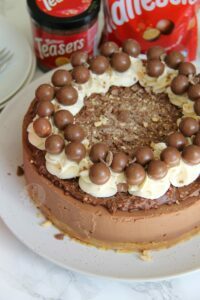 Remove the cheesecake from the tin, and spread the tub of Malteser Spread on top. 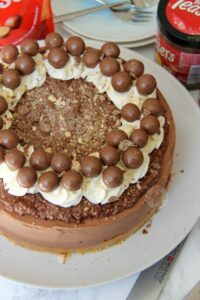 Whip together the double cream, and icing sugar and pipe on using a 2D Closed Star Piping Tip, add some maltesers, and some more crushed Malteser’s. You could easily use Mascarpone instead of the Philadelphia if you wish, but make sure its 500g worth, and use the full fat version. I always set my cheesecakes in the fridge overnight otherwise they risk being a little runny still and slipping off the biscuit base but if you want to risk it then go for it! If you think its not setting, 99% of the time its because you didnt whip it enough! This recipe has been updated since the original post – the original base was 150g Oreos, and 150g Malted Biscuits if you still wanted to make it that way. Older Next post: Individual Chocolate Mousse Puddings! Newer Previous post: No-Churn Crunchy Cookie Butter Ice-Cream! Ah, when I made this recipe it was 200g, so only use 200g! Hiya Jane, love your recipes! Just wondering, you can’t get malt powder where I live, can you recommend any alternatives or is it ok just to leave it out ! Thank you ! You can leave it out, but I would increase the icing sugar to 125g! Hello, just wondering how you would make mini cheesecakes what measurements would i use? hi I make a lot of your recipes and love them, im going to make the maltesser cheesecake can you add maltessers to the cheesecake mix? I have made a few of your cheesecakes and they are always delicious but don’t seem to set properly. I have a large kenwood mixer like a kitchen aid one and seem to whisk it forever but usually always get the same results. I’ve seen you said it’s not been whisked enough but how long is enough. It looks thicker but just doesn’t set. Can’t wait to made some more of your recipes! Can you use mascarpone instead of full fat cheese? Hiya! Yes you can as long as its the full fat one! Can i use Cocoa powder instead of Horlicks to make it a chocolate cheesecake? Would 100g be.ok? I made it for Christmas Day, the family loved it, for my family the richer the better. Hi Jane, going to try this for Christmas dessert. I couldn’t get chocolate malt powder though, only original malt powder. Will that be ok or should I do have drinking chocolate powder? Thanks! Do you think it would be possible to use some of the spread inside of the cheesecake instead of the normal milk and white chocolate? You definitely can! However, the chocolate does make it set better so be prepared for it to not be quite as well set without it. 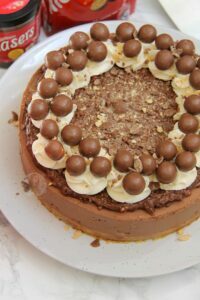 Hiya Jane, Merry Christmas I was going to say my next venture of baking will be the chocolate maltesser cake with melted white choc on top with holly and red berries for our Xmas day show stopper. I live your web page and wish you and your family a healthy new year 2018. You’d have to google the ingredients. Hi love your recipes-your triple chocolate cheesecake is a family/office favourite! I can’t wait to try this one but just wanted to check-in your commentary it says cream then melted chocolate but the recipe says melted chocolate then cream? Also what do you think about adding some chopped malteasers to the mix? Great to put a face to your web page, I am now a fan, hoorah. I would tie your hair back though in any future videos just in case any stray hairs get I. To the delicious recipes make. Well done I love the tutorials. Thank you. I don’t sell the cakes, or give them to anyone else apart from friends and family who know about my hair so its fine. I am trained in food & hygiene, so I am fully aware of everything, but when you’re at home by yourself, it doesn’t matter. If it happens with every one, then you’re not whipping them up enough. Best way is to put the biscuits up the side, not just on the bottom, so it creates a barrier so it can’t slip anywhere. This looks wonderful can’t wait to try it! I’m in Australia and can’t find Malteser spread. What else could I use please? Also could I use Milo powder as the malt powder? Thanks for your advice. 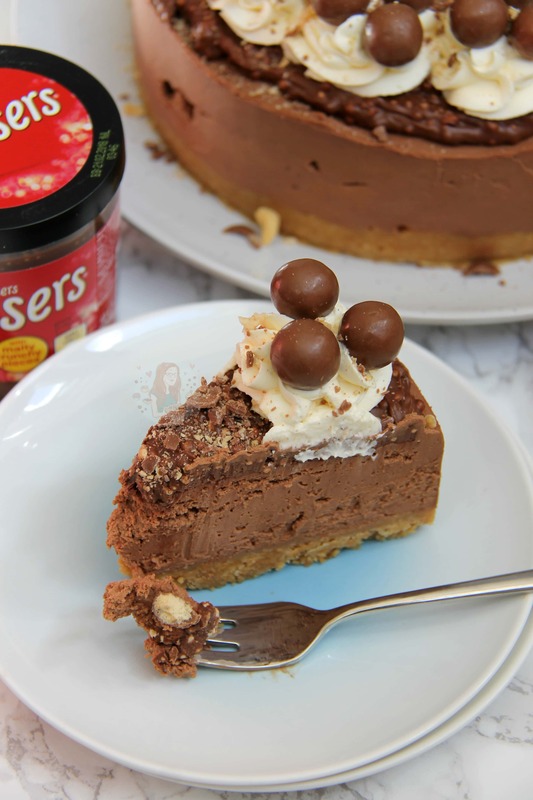 I made this with Milo (a bit more chocolatey than Horlicks) and added crushed maltesers to a creamy chocolate paste/ spread as a replacement for the malteser spread. I’m in Austtalia too – Ovaltine drink powder is very malty. Might suit better than milo. I’m in NZ and we don’t have Malteaser spread either but there was a UK import site that I was able to get it from for about $8 including shipping. Maybe Oz has something like this too. You can if you like! Hi, just made your cheesecake but it looks like the mixture may have split, I whisked for a long time but it didn’t seen me to get any thicker. Tasted amazing and have put it in fridge for 24 hours until I serve but just wanted to ask your advice and if this has happened to you what would you suggest please? When you use oreos do you keep the cream centre or remove it? Keep them in! Just follow the instructions as stated. Can this be frozen? How long should it be left out of the freezer to defrost? Tried your recipe this week, so delicious! I didn’t whip it quite enough (I was rushing a bit) but it was still awesome, it still set pretty well considering, was just slightly soft. I usually use all Phili cheese but gave mascarpone a try and now a convert. It was so good I licked the whisk clean in a not so ladylike manner! Thank you. Hahaha I don’t blame you… I always lick the whisk clean! And yes, the mixture is delicious isn’t it!! I’m attempting to write my e-book as we speak haha! But thank you so much! Made this today for a friends birthday rather than normal cake, she said it was the best cheesecake she’d ever tasted! Ahhh thats amazing!! I am so glad she liked it so much!! I warned you, and so here’s the next thing that happened in my kitchen, that you are responsible for 😉 Although… this time, for reasons beyond my control, I got a bit more creative than the last time round. Anyway, what I really just wanted to tell you is that I followed another of your brilliant recipes (or two of them, actually) and took pictures of the extremely tasty result! this looks so delish! i always bake mine but it can be sooo time consuming!! i am going to try one of your no-bakes soon. yum!! Gosh, you always post such delicious recipes! It looks AAAAAMAZING!!! I’ll def try it someday. Thank youuuu! And please do! I forgot to say that I just love your new gravatar picture, very cute drawing. I will have to check out her work! 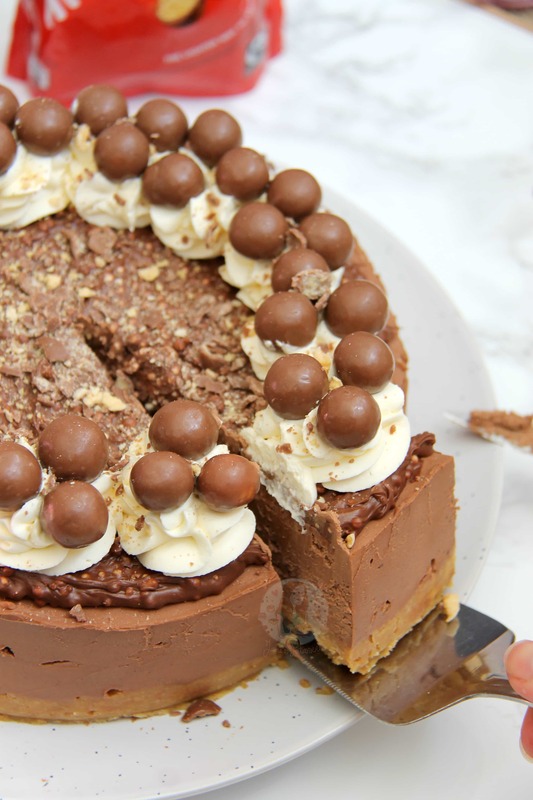 How many Maltesers are in the crust, recipe doesn’t say. Will defo.. Be trying this? Ohh yay please do!! ?